"Tatiana is very knowledgeable in her field, reliable, and dedicated to the specific needs of each client (as a church, our web presence has unique elements, and Tatiana has worked well with our administrators). We value her creativity, and the pride she takes in the final results. I recommend her highly for website work." "Tatiana Harrison has been the sole designer and creator of our Church website. She has produced a great looking, as well as functional, site to view. She is very prompt and courteous to deal with regarding updates and changes to our site. I would highly recommend her for any website design you may have in mind." Created With: PHP, HTML, and CSS. In October of 2010, I finally had the time to update the HTML and CSS of this website and upgrade the HTML files to PHP, to allow the use of a template file. Going back and cleaning up HTML and CSS I had written back in 2006 made me realize just how much I've learned since then. This website, as one of the first websites I designed, had some very poorly-written HTML and CSS. Now, however, the website's HTML and CSS has been updated; a template PHP file has been created to simplify updates; and some CSS3 elements have been added to the design as well, though these elements are only viewable in the Chrome or Opera browsers. 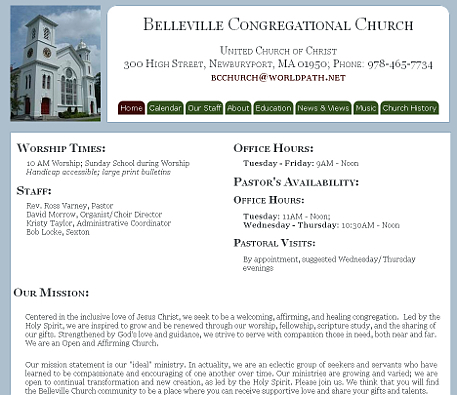 Belleville Church contacted me in 2006 to design their first website. The unique challenge with this site, as with any organization's first website, was figuring out content and function. With the design, I sought to emphasize the beauty of the church's building by matching the color scheme to the picture of the church.